The Moskva River with its tributaries flow through the Odintsovo district of Moscow region. 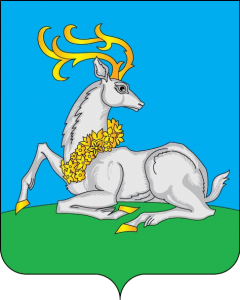 The coat of arms of Odintsovo shows a white deer, representing cleanliness and purity. The deer lies facing the west, although gazes to the east. It is the destiny of Russia to harmoniously unite the East (The Spirit) and the West (The Matter). 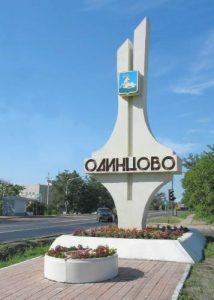 Odintsovo has been known from at least 14th century, but there is no clear idea about the origin of the name Odintsovo. Surely, it could be related to Odin. 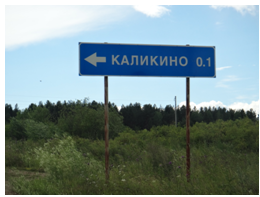 The last letters (‘tsovo’) indicate only a status of settlement. In Russian, odin literally means one. The One Supreme Being, the creator and ruler of the Universe. In Germanic mythology, Odin is a widely respected god. He is associated with healing, knowledge, battle, sorcery, poetry, the runic alphabet, etc. In order to gain wisdom, Odin sacrificed one of his eyes at the spring of Mimir which was the source of all knowledge. See Kashmir. This aligns with the ancient Egyptian mythos about the Eye of Horus and the Eye of Ra. The All-Seeing Eye is one of the oldest depictions of the Deity. 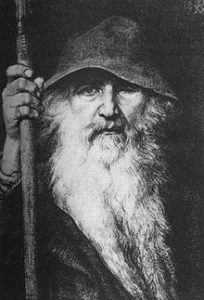 Most of the information about Odin stems from the Norse mythology or the Scandinavian folklore. Old Norse was a North Germanic language that was spoken by inhabitants of Scandinavia. It is believed that this term comes from the Swedish (former Danish) region Scania. There is no clear hypothesis regarding the origin of the name Scania. The version with Germanic root is weak. Indeed, Odin is a prominently mentioned god throughout the recorded history of the Germanic peoples that are an Indo-European ethno-linguistic group of Northern European origin. They are known for their former habit to war. 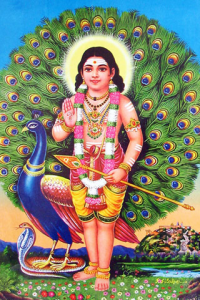 Skanda is the Hindu god of war, the son of Parvati and Siva. See for rivers Siva in Russia. In Buddhism, Scanda was the son of a virtuous Buddhist king. The Buddha instructed Skanda to guard the Dharma and the Buddhist teachings. Skanda is a Bodhisattva. It is the Sanskrit term for anyone who has achieved Enlightenment or Buddhahood, but has vowed to return to the samsara world to aid all sentient beings on their paths to Buddhahood. Tara is a female Bodhisattva in Mahayana Buddhism. See Tara River in Vladimir region. In Sanskrit, the name Skanda has many meanings including, king, cleaver or learned man, attacker, etc. Skanda is a forceful attacker in war against devil beings, but his name also signifies one who has accumulated the power of chastity. He is known as the defender of all Sadhus (holy persons in Hinduism). Skanda is also known as Sanat Kumara. In Sanskrit, it is ‘Eternal Youth’ (from Sanat ‘eternal’, Ku ‘with difficulty’ and Mara ‘mortal’). Oldest but always young Kumara, the Lord of Shambala and the Pleiadian Head Master, is the one leads towards Brahman, the Highest God. Sanat Kumara is one of the Four Kumaras who are the first mind-born creations and sons of the creator-god Brahma. In the Theosophical publications Sanat Kumara is an Ascended Master of Light. In spiritual icons Sanat Kumara is shown as an ever-youthful man, riding or near a peacock. Is it not only the national bird of India, but also a symbol of Russian city Serpukhov where the above mentioned Nara River meets the Oka River. Serpukhov is located in Moscow region, rich of Sanskrit toponymy. When looked from such angle, Scandinavia = Skanda + Navi. Navi has several meanings worldwide. On one hand it is a Hindi originated name, meaning ‘New’. It fully correlates to the same Russian word. If read from the right to the left, Navi becomes Ivan that is the most popular Russia name in the world. Navi refers to the prophet in the Hebrew Bible and is similar in meaning to the Arabic word ‘nabi’. 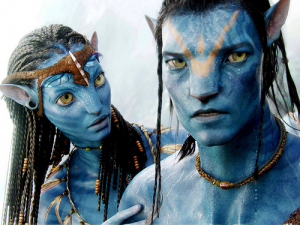 Naʼvi is a humanoid alien race in the movie Avatar. See village Navi in the Tver region (Russia). The Mahabharata and other scriptures say that Sanat Kumara helps the Divine Plan of Creation. He was Pradyumna, Krishna’s son. Together they defeated a strong and ferocious demon named Nikumbha who abducted a Yadava princess, the granddaughter of Krishna. See Yada River in Vladimir region. Nikumbha is the son of Kumbhakarna (Sanskrit, lit. pot-eared) who is the younger brother of Ravana the main antagonist of the epic Ramayana. Ravana is a Sanskrit word that means ‘roaring’. Ravan is also the name of a river in the Leningrad region. The Ravan River is located ~100 km. south-east from the center of Saint-Petersburg. The Leningrad region is called after Lenin born in the present day Ulyanovsk region where river Sura (Surya) has its source. Ravana is considered to be the most revered devotee of Siva. See Russian rivers Siva. Kumbha is the Sanskrit term for a water pot. Also, it is sign of the zodiac Aquarius that is a symbol of Russia and Veliky Ustyug. Moreover, Kumba is a mount of the Urals and the South African iron-ore company. Kumba Iron Ore is the fourth largest iron-ore producer in the world and the largest in Africa. Major Russian iron ore and metallurgical companies are based in the Urals having the rich natural deposits. Mount Kumba is located ~550 km. 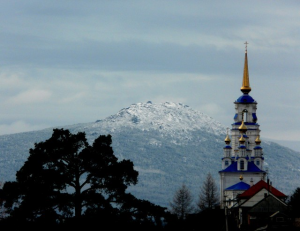 south of the river and mount Naroda that is the highest peak of the Urals. In Sanskrit, Kumba is enclosure round a place of sacrifice, thick end. Golden Stone mount is next to the Kumba. In Sanskrit, gold is kumbha. ~10 km. north from Savvino-Storozhevsky monastery named after St. Savva (14th century). In Sanskrit, Sava means ‘commander’, whereas sattva means ‘essence’. In the name Swatovo the root is Swat, whereas ending ‘ovo’ means a status of settlement. There are the Swat River and Swat District in the northern Pakistan, near Kashmir. In Sanskrit, Swat means ‘to beat off, as insects; to bat, strike, or hit’. Swat valley area is considered as a possible location of Uddyana. It is a legendary Buddhist country that existed in the second half of the 1st millennium AD in Northern India. In some Tibetan traditions, Uddyana is identified with Shambhala. See below Solombala, an island on the Northen Dvina River near its exit into the White Sea. It is believed that the 8th-century Indian Buddhist master Padmasambhava (lit. ‘Lotus-Born’) was born in Uddyana. He is widely recognized as a ‘second Buddha’ across Tibet, Nepal and the Himalayan states of India. Ujjain is one of the sacred sites of the Buddhists and the Hindus, center of Hinduism and Sanskrit learning. Initially, the ancient Ujjain was located around the Kalika hill (see below Kalka & Kalika). Also, see Ujjain & Ashoka. Udine is a city and commune in northeastern Italy. Udina is the name of two Russian rivers: one belongs to the Volga basin and the Caspian Sea, the other belongs to the Baltic Sea basin. Udina is a village located in the Datia district of Madhya-Pradesh. Datia is an ancient town mentioned in the Mahabharata as Daityavakra. In Hinduism, the Daityas are a clan or race of Asura, the children of Diti and the sage Kashyapa. See Russian village Osurovo in the Yaroslavl region. Among the notable daityas are Prahlada and Holika. See Prahlada in Russia. Udina is ~340 km. south of Delhi and ~200 km. from Lucknow. See Russian village Delhi in the Tver region and the settlement Lucknovo in the Vladimir region. The road from Delhi to Udina comes through Mathura and Agra. Mathura was homeland and birthplace of Krishna who was born in Yadu dynasty. See Russian river Yada in the Vladimir region. Kashipur village is less than 2 km. from Udina. See Kashmir. 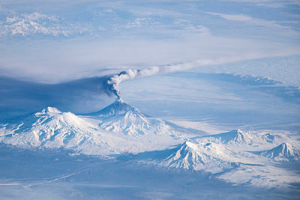 Udina is a volcanic massif located in the central part of Kamchatka Peninsula, Russia. Udina is located in the Klyuchevskaya group of volcanoes. Here is the Klyuchevskaya Sopka that is the highest active volcano of Eurasia. Another Sopka of this group is the large volcanic massif called Ushkovsky. Ushu is a tributary of the above mentioned Swat River in Pakistan. See above Russian village Swatovo. The name Ushkovsky correlates to the Russian name ushko that is ear. In Sanskrit, ear is karna. In a broader sense, it means capable of widely perceiving what is happening, not missing anything. In Russian mythology Karna is the goddess of birth, incarnation and rebirth, the reflection of the cycle of the Universe. Karna is the mother of the gods and all living things. The goddess Karna is also present in the ancient Roman pantheon. The Romans revered Karna as the goddess of the human body. Karna is the name of several Russian settlements, rivers and lakes. Between the Karna lake and city of Bryansk there are settlements Sweet Buda, Full Buda and Lookout Buda. Budha is a deity in Puranic mythology. It is the name of the founder of Buddhism. In Sanskrit, budha means ‘wise, learned man, awaking’. Bryansk is located on the Desna River ~350 km. south-west of Moscow. The Moscow region has its own two different rivers called Desna. Karna is one of the central characters of Mahabharata. He was the son of sun god Surya, born to Kunti (the daughter of a human king) before her marriage with Pandu, the earthly father of the Pandavas. It is believed that Karna founded the city of Karnal in present Indian state Haryana in North India. The capital of this state is Chandigarh. Sukhna Lake is among its notable sites. Sukhna Lake (India) is located in Chandigarh near the foothills of Sivalik Hills (the Himalayas). See Russian rivers Siva. Sukhna Lake is artificial created by Swiss-French architect Le Corbusier in 1958 by damming the Sukhna Choe, a seasonal stream coming down from the Sivalik Hills. Le Corbusier prepared the master plan for the city of Chandigarh after invitation from India’s first Prime Minister Jawahar Lal Nehru. Chandigarh is located ~260 km. north of Delhi. See village Delhi in Tver region of Russia. Indian Sukhna is a sanctuary for the Siberian duck, storks and cranes, during the winter months. Sukhona River (Russia) is largest and longest river in the Vologda region of the Russian North. Its length is ~560 km. Rivers Sukhona and Yug form the Northern Dvina River near the town Veliky Ustyug that used to be the gateway to Siberia. All these three Russian rivers have Sanskrit names and, therefore, deep links with India. See Kur island of the Northern Dvina River and Navlakhi Port in Gujarat. Pur Navolok (nowadays city Arkhangelsk) lies on both banks of the Northern Dvina River near its exit into the White Sea of the Arctic Ocean. In Russia it is often associated with the Ocean of milk in Hindu cosmology. The devas and asuras worked together for a millennium to churn the ocean and release Amrita (the nectar of immortal life). See village Osurovo in Yaroslavl region of Russia. The first documented settlers (XII century) of Veliky Ustyug were the citizens of Rostov Veliky (Yaroslavl region) located on the shore of the lake Nero comparable in meaning and pronunciation to the above mentioned surname of Indian Prime Minister Nehru. Veliky Ustyug and Russian capital Moscow have the same year of foundation (1147). 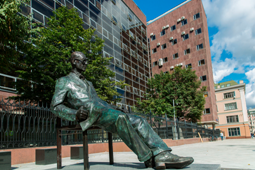 In the center of Moscow in 2015 was unveiled a monument to Le Corbusier, next to his building (Centrosoyuz, 1933) that is one of the favorite spots for architectural walking tours, along with the famous Stalin skyscrapers. Centrosoyuz building constructed by Le Corbusier and Nikolai Kolli was the headquarters of the Central Union of Consumer Cooperatives. It is the only building of Le Corbusier in Moscow, but very symbolic indeed. Cooperatives represent a kind of future world community described in the works of many philosophers including the Roerichs stated that knowledge and beauty are the real cornerstones of evolution, the gates to a world community. Chandigarh’s logo is «The City Beautiful». Not by chance Chandigarh was Nehru’s dream city. Le Corbusier had a strong belief in the ability of architecture to create a sacred and spiritual environment. A recurring motif in Le Corbusier’s architecture was The Open Hand. It is a sign of peace and reconciliation. It is open to give and open to receive. 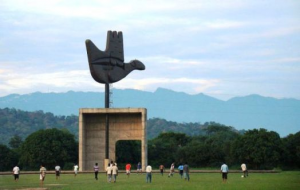 The largest of the many Open Hand sculptures that Le Corbusier created is in Chandigarh (26 meter high). Upon the architect’s death in 1965, United States President Lyndon Johnson said, «His influence was universal and his works are invested with a permanent quality possessed by those of very few artists in our history». The Soviet Union added, «Modern architecture has lost its greatest master». Chandigarh’s name is liked with the goddess Chandi. She is said to be one of the most spectacular of all personifications of Cosmic energy. Chandigarh or Chandi-ka-Garh, literally means the fortress of goddess ‘Chandi’. The hill fortress overlooks her ancient temple at Chandi-Kotla (~7 km. east of Chandigarh). See Russian town Kotlas at the confluence of the Northern Dvina and Vychegda Rivers in Archangelsk (Pur Navolok) region. Chandi cannot tolerate evil acts and slays evil doers without mercy. It is believed that Chandi (Durga) killed Mahisasura at this spot over 5000 years ago. Mahisasura was an asura (demon) and intended to extinguish all the Devas (gods) since they were the main enemies of Asuras. See village Osurovo in Yaroslavl region (Russia). The legend is important in Hindu mythology because the goddess Durga was incarnated in order to slay Mahisasura. It is claimed that the first President of India Rajendra Prasad visited the temple in 1953 and was impressed with the ancient past of the temple. He named after it the local police station, railway station and the adjoining village (Chandimandir). Later the city was titled Chandigarh. The Yadavindra Gardens at Pinjore (~7 km. north of Chandi-Kotla) are believed to be built by Mughals. See Russian Yada River in Vladimir region that has a special connection to the ancestor of the Mughals. His name Tamerlan is said to have meaning ‘the one who knows Merlin’ (the legendary wizard from Arthurian legend). Tamerlan’s personal seal was the same as the symbol of the Shambhala (see below). Kalka is ~5 km. north of Pinjore and its Asia’s best 17th century Mughal garden. Kalka is a town near Chandigarh in the foothills of the Himalayas. Kalka is ~15 km. north-east of the above mentioned lake Sukhna. 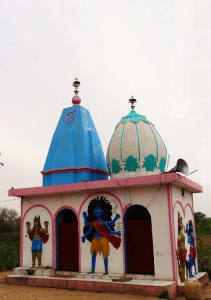 The name of this town is derived from the goddess Kali. There is no clear idea about the etymology of the most populous state in the United States. There must be an ancient link of Kalifornia to Kali. In the 19th century north of the contemporary state California and whole Alaska were part of the Russian America founded by the people connected to the above mentioned Russian town Veliky Ustyug located on the banks of the Sukhona River. Kalka River is famous in Russian history for a battle fought in 1223 on its banks between a coalition of several Russian principalities and the Mongol Empire. In the same present-day Donetsk region is the Saur Grave. See Saurovo in the Moscow and Tver regions. Another battle of the Russian troops with Mongolian army took place in 1238 on the banks of the river Sit (modern Yaroslavl region of Russia). Sita is a Sanskrit word meaning white, light, bright, etc. Kalka is also a Sanskrit word meaning sin, filth, etc. The name ‘Kalki’ could mean ‘destroyer of the filth’. In Hinduism, Kalki is the final incarnation of Vishnu who will lead in a new Golden Age (Satya Yuga). This Epoch is now often associated with the Age of Aquarius. Aquarius (Kumbha in Snaskrit) is depicted on the coat of arms of the Russian town Veliky Ustyug where the above mentioned rivers Sukhona and Yug form the Northern Dvina River floating to the White Sea (Arctic ocean). Kalki is foretold to appear at the end of Kali Yuga that is believed to have finished after the Kursk Battle. In Tibetan Buddhism, the rulers of the mystical Shambhala Kingdom hold the title of Kalki, Kulika or Kalki-king. In Sanskrit, Shambhala (also spelled Shambala) is Sambhalaḥ. Solombala is an island on the Northern Dvina River and a historic part of Pur Navolok (Arkhangelsk). Kuliga (see above Kulika) is the name of Russian village where the Kama River begins. Kalikanagar is a village in the Indian state Gujarat. Around the Garh Kalika hill on the bank of river Kshipra was located the ancient Ujjain (see above). According to Mahabharata and other Puranas (Skanda Purana) it came into existence some 3000 years ago. Today it is Ujjain city in Madhya Pradesh state of central India. Once every 12 years, the Kumbh Mela fair takes place on the city’s riverside ghats. The Kshipra (Shipra) River is one of the sacred rivers in Hinduism. According to Hindu mythology, Ujjain is one of four places where Vishnu dropped drops of Amrita (the drink of immortality) while transporting it in a kumbha (pot). Kalikino is a village on the above mentioned Sukhona River near town Veliky Ustyug whose symbol is Aquarius with two pots or kumbha (Sanskrit). Ujjain is located in the center of India. In the past it was the capital of Avanti Kingdom described in Mahabharata. Ashoka (268 — 232 BC) started his rule as the Governor of Avanti at the age of 18. It was the first territory he ruled. Under Ashoka the Mauryan Empire reached its full power and became the largest empire ever in the Indian subcontinent and one of the world’s largest empires at that time. Ashoka is internationally recognized as one of the preeminent rulers in the human history. He spread Buddhism in India and other counties. Ashoka was a grandson of Chandragupta Maurya (340 — 298 BC) who was the founder of the Maurya Dynasty. Mayura is peacock in Sanskrit. It is the national bird of India and symbol of Russian city Serpukhov located on the banks of the Nara River. 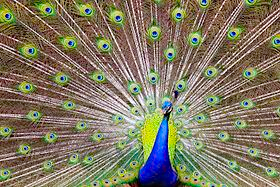 Peacock’s open tail symbolizes the Heaven and a higher state of consciousness. Indeed the Maurya Dynasty ruled almost the entire Indian subcontinent from in the 3rd century BCE and was unique in many aspects from the very beginning. The first Mauryan ruler Chandragupta Maurya was a fugitive in the camp of Alexander the Great who was fighting his way into India. After the death of Alexander in Babylon, Chandragupta managed to unify India for the first time in history. Interestingly enough, but the name Babylon has the same meaning as the holy Hindu city Haridwar. It is the gate of god(s). Chandragupta Maurya built one of the largest empires ever in the Indian subcontinent, but in the end of life he left his capital and performed the Jain religious ritual of peacefully welcoming death by fasting. This event supposedly took place ~150 km. from Bangalore. Ashoka’s name is derived from Sanskrit word «Asoka» literally meaning ‘sorrow-less’ or ‘without sorrow’. 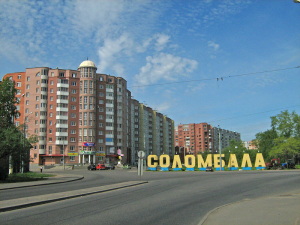 Osokino is a settlement on the M-8 in the Yaroslavl region. Earlier this federal highway was called King’s road. It is said that Ashoka was labeled as Ashoka the Terrible. Such title still have Ivan the Terrible, the most famous and beloved Russian ruler (16th century). Ivan loved India and played the chess until the very moment of his death. In Sanskrit, the Terrible is Urga. It is one of Siva’s names. See Russian rivers Siva and Ugra. Despite his military and political success Chandragupta Maurya failed to annex the small independent feudal kingdom of Kalinga (roughly present state Orissa) in central-eastern India, on the Bay of Bengal. It would be completed in 260 BC by his grandson Ashoka. After the bloody conquest of Kalinga, Ashoka realized the magnitude of horror associated with war and converted to Buddhism. It is presumed that the Kalinga War was fought in the area of Dhauli hills located ~8 km. south of Bhubaneswar. A white peace pagoda was built on the top of the hill in the 1970s. At the same a monument of Lenin was erected in Russian historical town Aleksandrov that was the capital of the country in the 16th century under the rule of the above mentioned Ivan the Terrible. Aleksandrov is ~100 km. north-east of Moscow. Today, Aleksandrov is a part of Vladimir region that has ancient ties with India. There are certain resembles between the hand gestures of Lenin in Aleksandrov (right) and Buddha in the Dhauli peace pagoda (left). Equally, the basic ideas of Communism (world community) and Buddhism have much in common. It is known that The Masters of the Ancient Wisdom have named Lenin as a Mahatma. 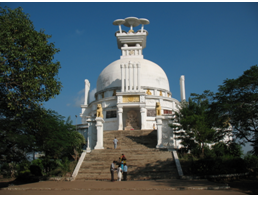 Ashoka made Dhauli an important centre of Buddhist activities. One of the most complete edicts of Ashoka is here engraved on a mass of rock. He expresses his concern for the welfare of the whole world. Ashoka did not attack any kingdom but proceeded on a mission of peace. Ashoka sent missions abroad to preach Buddhism, erected pillars and stupas (domed structures that house relics of the Buddha) throughout Indian subcontinent, encouraging people to give up violence and live in harmony with each other and with nature. 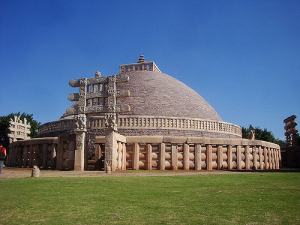 The famous Great Stupa in Sanchi was originally commissioned by Ashoka in the 3rd century BC. Today, it is one of the oldest stone structures in India. Sanchi is significant for Buddhist around the world. The stupa is located ~200 km east of Ujjain. Ashoka pillar capital of Sarnath has become the State Emblem of India. Sarnath is located north-east of Varanasi (ancient Kasi) near the confluence of the Ganges and the Varuna rivers. Sarnath is the place where Buddha delivered his first teaching and Buddhist community was born. The name Kalinga is thought to have come from the Kalingas who have been mentioned as a major tribe in the Hindu epic Mahabharata. Its major character and the chief antagonist is Duryodhana, the eldest of the Kauravas. Kuru king Duryodhana’s wife was from Kalinga and the Kalingas sided with him in the Kurukshetra War. Duryodhana’s closest friend is the above mentioned Karna. Kaliningrad (lit. Kalinpur) was the previous name of modern Korolev where the Soviet Union and the whole humanity made the first step into Cosmos in 1961. Russian city Kaluga is named «The Cradle of Space Exploration». Kalika hill is the initial place of the ancient Ujjain. See above Kalka & Kalika.